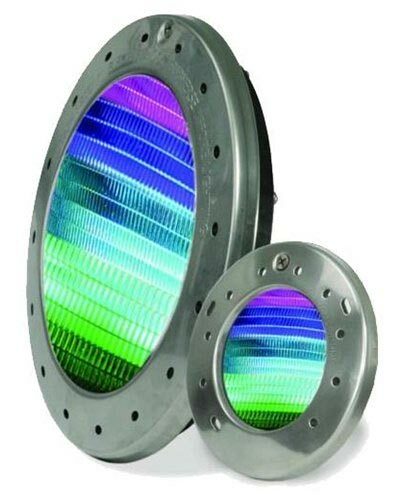 If you’re reading this, you’ve obviously seen the wide variety of color LED lights to choose from and drove yourself mad wondering which one would work best for your application. Luckily the answer is not as difficult as you think. For the most part a majority of the lights offer similar functions and abilities but also some very distinct qualities that allow you to tailor it specifically to your system. Let us begin by finding out exactly what kind of light you are replacing. The easiest way to identify what type of light you have is to pull that fixture out and look for any kind of identifying marks on the housing. A model number would typically be best but sometimes older fixtures have all identifying numbers worn off, forcing you to rely on other means of identifying your light. Get out a measuring tape and measure the diameter from one end of the face ring to the other. Your typical pool light will measure around 10.12 inches where the average spa light is closer to 6 inches. Although most pool and spa lights are universally sized, there are a few out there that are a little less common; such as the SwimQuip. While this light is less prevalent now, it still seen in some older pools today. 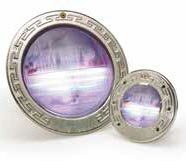 This light measures about 7.25 inches in diameter. Currently, SwimQuip lights can only be replaced with a retrofitted J&J ColorSplash light or by replacing the bulb with a LED bulb fitted for the SwimQuip. 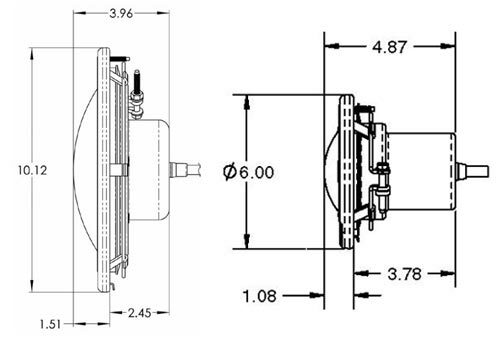 Knowing what specs your current light is should make locating its replacement very simple. Make sure you also take into account the voltage and the length of cord you need to ensure everything is correct. If the voltage is wrong you can risk blowing the bulb. Once you have determined the type of light needed, you can now move on to picking out the model that best suits your system. Depending on your needs, you still may have several options to go with. If all you really care about is that the lights rotate through colors then you can choose from any of the main brand fixtures. Below is a list of all the major brands and the features they offer. All of which may be operated with merely a flick of the light switch. The Hayward ColorLogic offers five crisp, vibrant colors and seven light shows that seem to flow endlessly throughout the pool. It comes equipped with either a plastic or stainless steel face ring for corrosion free performance. It is available only in 12V so make sure when purchasing this you pick up a transformer as well. You can manipulate the colors and shows manually by toggling your light switch. 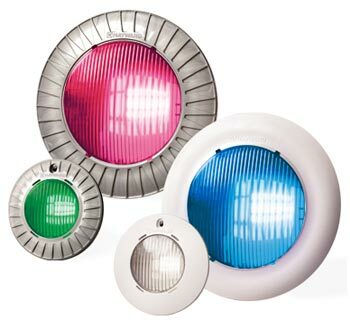 Or take ultimate control over the color/show desired when hooked up to the Hayward Prologic or Omnilogic systems – this system will also offer four more light shows. But remember, this ultimate control feature can ONLY be achieved with one of these systems. Similar to the Colorlogic, the Jandy Watercolors LED light offers most of the same features but comes in 12V and 120V. It also dons a polished stainless steel housing, giving a sheen aesthetic to its appearance. Unlike all other LED’s on the market the Jandy Watercolors light only offers five shows but comes packed with nine distinct colors that are blended in transition with ease. 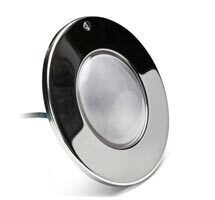 You may also obtain ultimate control of this light through the Jandy iAquaLink system, which will allow you to remotely control your lights from anywhere at the touch of a button. Next we will take a look at the Pentair IntelliBrite. This light is truly in a class of its own when compared to the rest. This is the only light in the bunch that can be controlled by multiple devices. Pentair offers a color wheel controller that can run these, Pentair automation, and even communicates with the Jandy iAquaLink as well. Its superior design can focus the light more towards the pool bottom while increasing the color intensity and effect. The lens on the light can be rotated 180 degrees to wither widen or narrow the beam to assure adequate light distribution. Pentair also carries an array of patio and deck lights that can link with the Intellibrite to create an even better outdoor show. *WARNING: Should you decide to go the route of just replacing the bulb make certain that your current housing is intact. Should any water leak into fixture the warranty will become voided. If you still have questions about choosing the correct colored LED pool light for your needs and wants please give us a call at 888-836-6025 or email us with your questions.